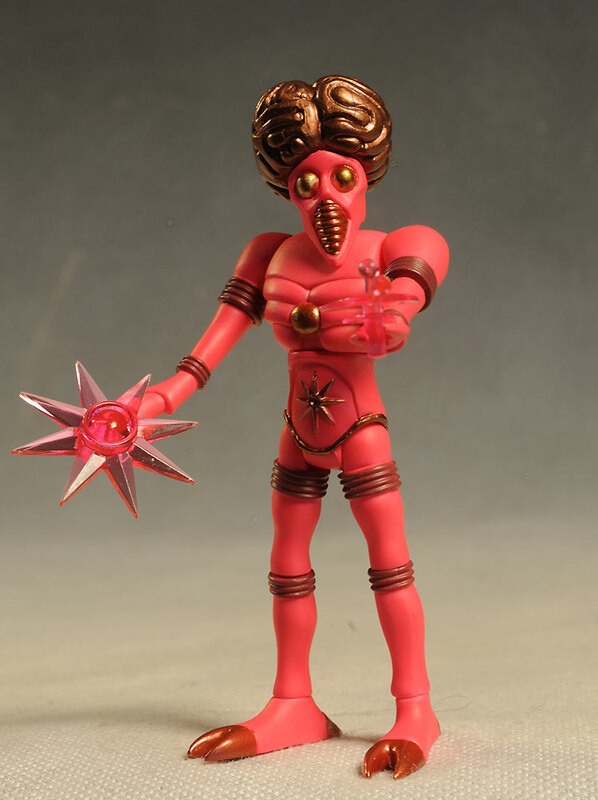 Last week, I checked out the new Cyclops figure in the Outer Space Men series from the Four Horsemen. I promised I'd follow that up with a look at the fifth wave of the Infinity Edition, and I always keep my promises! 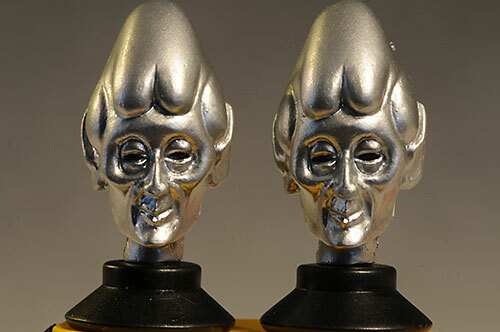 This latest wave includes Gemini and Orbitron, two very psychedelic aliens. You can pick them up directly from the Four Horsemen at their web store, where they are $26 for the pair. You can get them with Cyclops for $50, or just buy Cyclops for $26. The packages have a terrific, retro feel to the colors, graphics and text. They do a nice job telling a simple background story, and they show off other figures as well. There's plenty of character personalization too, something that is lacking with mass market packs. Even better, they are completely collector friendly, a true rarity with card back and bubble style containers. The card back can be slipped out of the bubble, and the figure removed and replaced with absolutely no damage. I skipped a photo this time around, but you can check the very recent Cyclops review for an example. Both of these designs are terrific, showcasing just how cool this line is. I really like Orbitron, because he incorporates so many of the best aspects of 70's aliens. While there's some influence on the design from Dr. 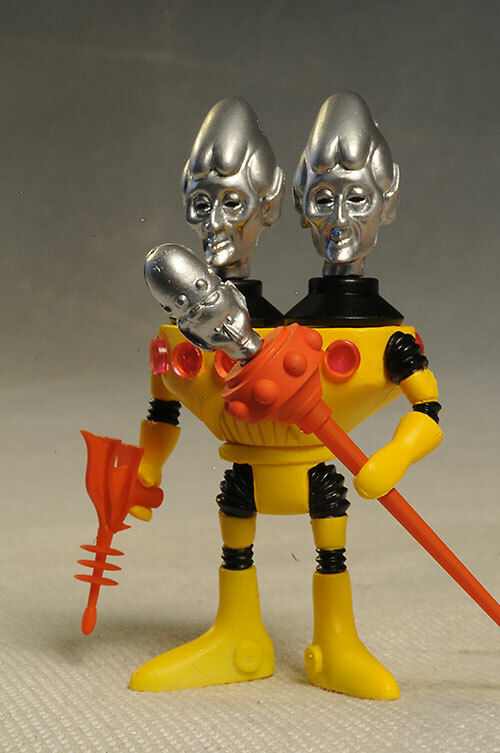 Evil and the Talosians, it's really the Metaluna Mutant that this guy steals his best features from. 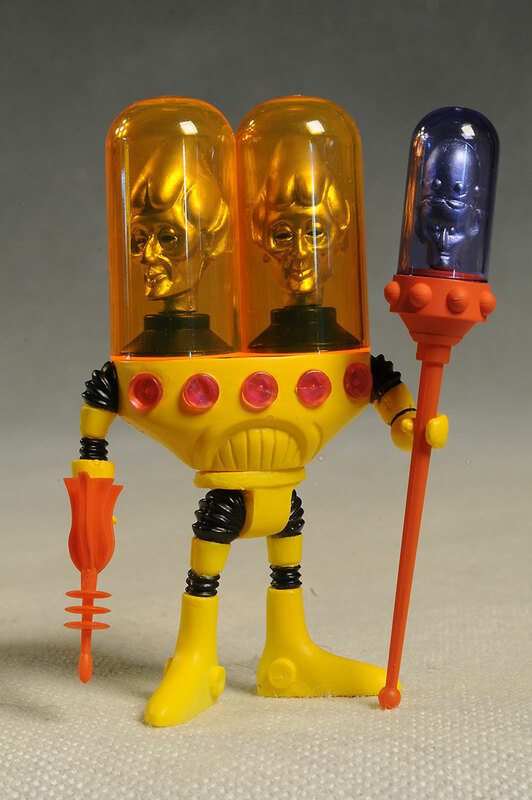 And since old MM is one of my favorite 50's monster designs, it's no surprise that I love Orbitron as well. Gemini takes the concept of the twins to an interesting place. With two equally sized heads, the figure has the look of emotionless danger. The head sculpt here looks very much like something that belongs on the original Star Trek, and that's clearly an influence. I also like that rather than go with one large helmet, Gemini has two smaller ones. That gives you more options - one on, both on, both off - when displaying, and adds some independence to each head's personality. 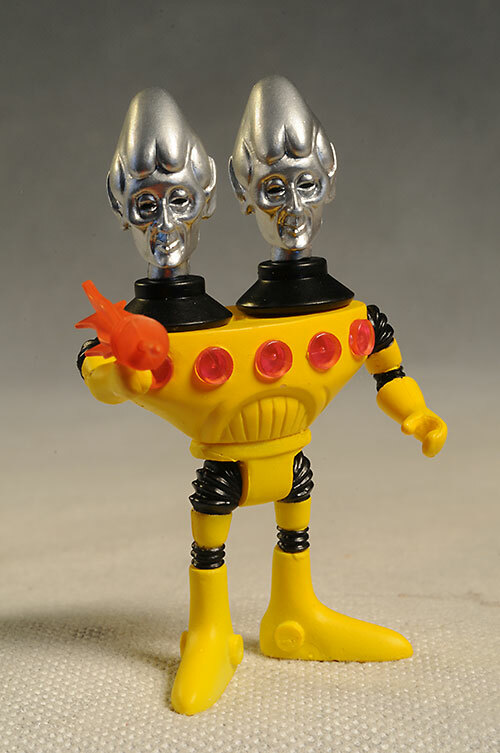 Gemini is one of the smaller figures, coming in at just 3 1/4 inches tall, while Orbitron is almost 4 1/2". They both stand terrific on their own, and their hands are sculpted to work with the included accessories. The paint work here is cleaner than on Cyclops, with very little slop and fairly sharp cut lines between the colors. There's some tricky colors here too, like the yellow body on Gemini. His silver heads are also difficult, but they've done a nice job getting a consistent coverage. The gold on Orbitron is another color that can be tough to get even and consistent, but they've done a great job. I also like the use of translucent colors whenever possible, and I think the color they chose for Gemini's helmet's is just about perfect. Because of the swappable body parts, the joints are simple cuts. On Gemini, both heads have cut necks, there's cut shoulders and wrists, cut ankles, cut waist, and T hips. While it doesn't sound like a lot, you can actually get quite a few very good poses out of these basic joints. Orbitron also has a cut neck, cut shoulders cut elbows, cut wrists, cut waist, cut knees, cut ankles and T hips. While he has a couple extra joints on the longer limbs, I found him a little less posable than Gemini. Not a lot, but a smidge. Both figures have some nice extras, although there's a bit of re-use as well. 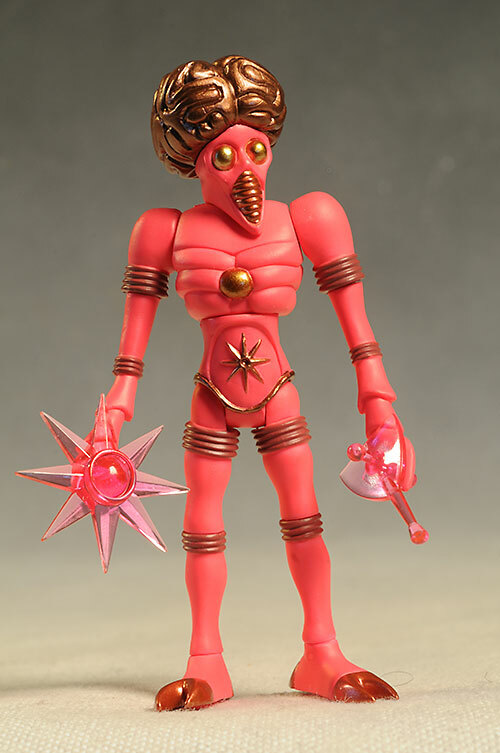 Orbitron has a translucent pink blaster, as well as a star shaped thingamajig. Not sure if it's some sort of small shield, or some sort of alien weapon, but it looks great - and can be used wit other figures, thanks to the Glyos system. Speaking of the Glyos system, Gemini comes with an extra pair of arms as well, bent at slightly different angles. I wish we'd gotten another pair with Orbitron as well - it would really increase the posing options. Gemini also has a small blaster, and one of the coolest staff's I've seen in the line. It has a removable helmet, shaped like the other two, that covers a third head on the top of the thin rod. it's a terrific looking design, and very Gemini specific. Any kid that loves retro sci-fi is going to eat these up. They're a nice size, and the sculpt, articulation and accessories make them great toys. Add in the customizing feature of the Glyos system, and you have some real winners when it comes to play. At $13 each, these certainly aren't cheap. 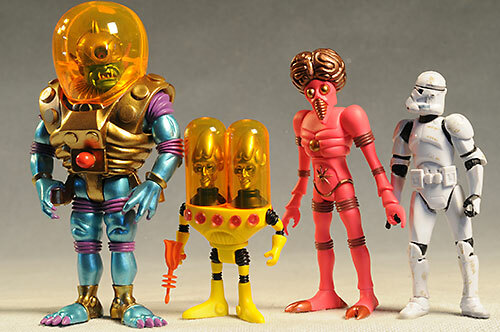 But they are a very unique set of cool, 70's sci-fi figures, with some terrific old school alien designs. They are also produced in very small numbers, and the ability to swap parts and create your own looks adds quite a bit to the basic value. Some of the parts - shoulders and necks in particular - were painted tight. Be careful loosening them up before you twist too hard. I found that if it seemed stuck, you could use hot water OR you could simple pull the part off first, before twisting it. That would break it free without fear of tearing the post. While I've enjoyed all the figures so far - and I will be kicking myself in years to come for not being a completist on this series - these two really stand out for me. I love the designs, and the colors and accessories really set them apart. Fans of the silly sci-fi of the 50's, 60's and 70's will appreciate these, and they'd make terrific gifts for kids and adults that have an appreciation for the fun designs. You're best bet is to pick these up directly from Store Horsemen, where the pair is $26. 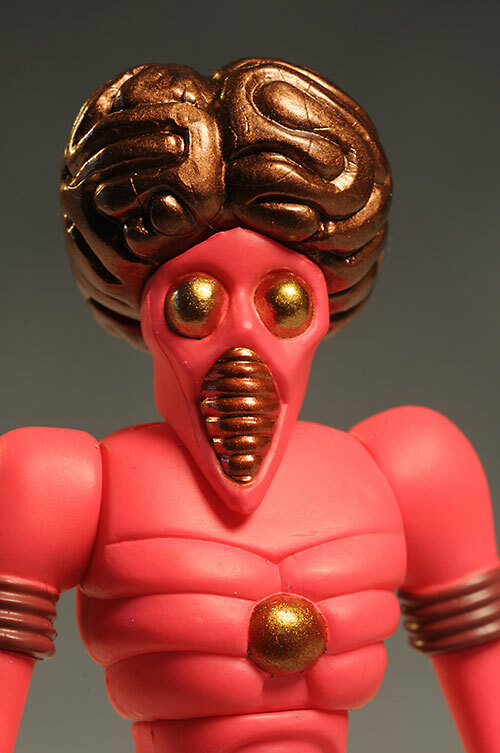 There's also an exclusive set of the Cosmic Creators available right now only at the Outer Space Men website. Or you can search ebay for a deal on these or some of the past releases. Just last week I looked at Cyclops, and I've checked out some of the other Outer Space Men in the past. If you like the Four Horsemen's work, you should check out their FANtastic Exclusives, like Scarabus and his variants, the Timekeepers, Ssejjhhorr, Xetheus, and Vaskhh. More recent, we had Allux and Izzy and the rest of the cat ladies, as well as the mutants from the same series.